But while I generally rewatch my favorite childhood Disney films every couple of years, this is one that I hadn't seen in forever. It had probably been at least ten years since I last watched it, so I was curious as to how much I'd remember. Well, as soon as I heard that opening song ("Once Upon a Time in New York City," or the longest song title ever), all of this nostalgia came rushing back. I remembered so much more of this film than I expected to! This movie might be set in the 80s, but it's inspired by a much older story: Charles Dickens' Oliver Twist. A couple of you guys mentioned this in my last Disney post, and my mind was blown. I had never, ever made the connection! Granted, I've never read Oliver Twist or seen any film adaptations, so I'm not familiar with the story. But it's true...this movie is inspired by Oliver Twist! I've since read a summary of the novel and it sounds like they changed some things, but they even kept the names of the main characters: Oliver, Dodger (the Artful Dodger in the book), Fagin, and Sikes. The voice cast for this film includes some pretty famous people, though not many that I'm especially familiar with: Billy Joel as Dodger, Dom DeLuise as Fagin, Bette Midler as Georgette, and a twelve year old Joey Lawrence as Oliver (known to me mostly as the guy who did that sweet tribute to Singin' in the Rain on Dancing with the Stars a while back). 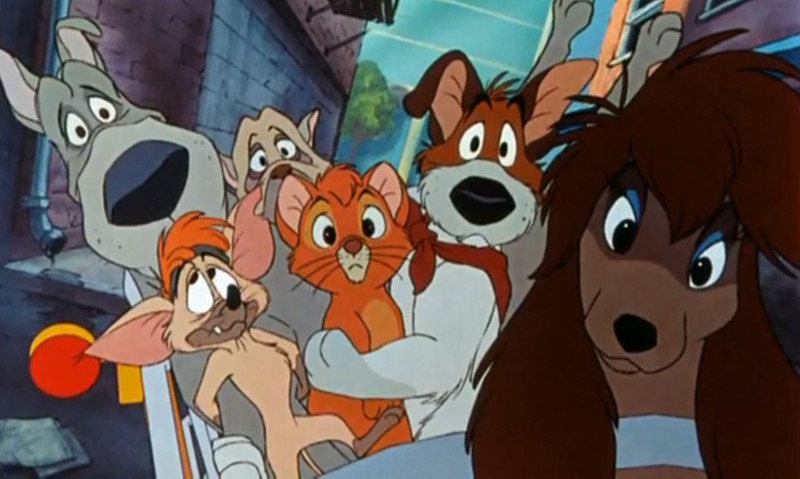 Oliver & Company has the tiniest bit of a Robin Hood thing going on, except in this case it's not outlaws stealing from the rich to give to the poor. The gang of dogs and Fagin seem to basically be pickpockets (I think? Or maybe they're just collecting junk? ), but at the same time they're not "bad." Even when Fagin decides to supposedly hold Oliver for ransom, you can't help but feel sorry for him. He's not a bad guy, he's just desperate. (And that Sikes guy is so creepy and threatening that it's no wonder Fagin feels desperate.) From what I read that's a big difference from the book...I think in the novel Fagin is just an all-around evil guy? Some familiar faces pop up in this movie, which isn't surprising. I've noticed before that characters from certain Disney movies will appear briefly in others, especially dogs- the dogs from Lady and the Tramp are scattered everywhere! A couple of them have cameos in this film, and you also get a glimpse of Pongo from 101 Dalmatians (and Anita, the lady from that movie, is briefly seen driving a VW Beetle). When I watched The Rescuers, I mentioned that certain parts of it reminded me of this movie. Especially the little girl getting kidnapped aspect. (The two little girls, Jenny and Penny, even look alike.) It turns out that Oliver & Company was originally going to be a sequel to The Rescuers, so I guess that makes sense now! I can't believe I'm saying this, but I actually like the music in this movie. I usually find 80s music to be pretty terrible (no offense to anyone who likes it, but it's just not my style! ), but I think these songs are catchy. Then again, it just might be the whole nostalgic aspect. All I know is that I've had "Why Should I Worry?" stuck in my head ever since I watched this movie. Next up on the list: The Little Mermaid. It was one of my favorite movies when I was a kid. What do you think about Oliver & Company? Is it truly a good movie or am I biased because it was a childhood favorite? I loved Oliver and Company thought its not my favorite Disney movie it is still a good movie. Got way to introduce kids to Oliver Twist. It's also a special movie to me because it's the first Disney movie that is actually "younger" than me. Mini Reviews: Into the Woods and Cinderella. Sewing: double pointed needles case. Sewing: Woodland Girl project bag.